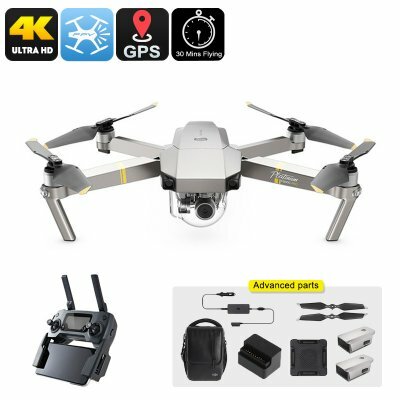 Successfully Added DJI Mavic Pro Platinum Drone Combo - 65km/h, 4K Camera, 30 Minutes Flight Time, 15KM Range, GPS, Flight Modes to your Shopping Cart. If you’re looking to take the most out of your Drone experience, the DJI Mavic Pro Platinum drone is perfect for you. This state of the art Quad-Copter comes with a range of improvements compared to its predecessor. Thanks to this, it has become one of the most powerful and long-lasting commercial RC drones available on today’s market. With its improved engine and battery, it offers stunning flights speeds up to 65KM/h and a flight time of 30 minutes. But this is not all, the improved hardware does not only make your drone fly faster and further, it also makes it quieter. This allows you to cruise through the skies in stealth without disturbing others. As a combo package, this version of the DJI Mavic Pro Platinum drone comes with a wide-range of extra accessories. You’ll be treated to extra spare propellers, a car charger, battery changing hub, battery to power bank adaptor, and a comfortable shoulder bag. All these charging accessories will provide you with extra efficiency when you’re out enjoying all the amazing features this latest video drone has to offer. Thanks to its abundance of different flight modes, this Quad-Copter is perfect for advanced and beginning drone pilots alike. With its compact and lightweight design, this video drone can be easily carried around no matter where you go. It comes packed with a stunning 4K camera that has been attached to a 3-axis gimbal. With its 1/2.3-Inch CMOS sensor and 78-degree lens, this high-end camera lets you shoot breathtaking 4K video and 12MP pictures. It even comes with WiFi connectivity, App Support, and HD 720p FPV support. This makes the drone perfect for all of you that love to explore your surroundings by sky or simply like to shoot beautiful aerial photographs from above. This 4K video drone from DJI comes with an advanced controller. The remote has a transmission distance of up to 7KMs. This truly offers you to unlimited freedom while you’re cruising through the skies at speeds up to 65KM/h. With auto take-off and landing, GPS support, and so many other features, this RC drone is sure to meet all your in-flight demands. The DJI Mavic Pro Platinum Drone comes with a 12 months warranty, brought to you by the leader in electronic devices as well as wholesale RC Drones..